Si estamos en odiado con esta facción podremos hacer una mision repetible con Mupsi Fricadena. Solo podremos subir hasta neutral con esta misión. La misión consiste en entregar 40 paños de lino y 4 viales de cristal, cada vez. Ganaremos 500 de reputación con trinquete por cada vez que entregemos la misión y 127 o 125 (no me acuerdo muy bien) con el resto de las facciones del cartel bonvapor (gadgetzan, bahia del botin y vista eterna). Mupsi se encuentra casi a la salida de trinquete, junto al camino que lleva al cruce, esta al lado de un arbusto y una hoguera. - 6p o 5p con Trinquete. - 3p o 2p con Gadgetzan. - 3p o 2p con Bahia del Botín. - 3p o 2p con Vista eterna. Hmm, a bunch of these quests that are listed as horde I'm successfully doing as alliance. Hopefully the looter sorts this out. I think these quests are classified as Horde because they are done in a Horde area. The same problem surfaces when you do the Captain Sanders' Treasure quest: it says Alliance only, but Horde can do it. Killing Southsea Cutthroats, Cannoneers, Brigands and their leader, Baron Longshore yields reputation with Ratchet until Revered. 5 reputation is given for everyone but the Baron, who yields 25 rep. A quarter of this reputation (1.25 and 5 respectively) is also added to your reputation with Booty Bay, Everlook and Gadgetzan, and this goes on until Exalted with those factions. Once the mobs turn gray to you, the reputation they give is dropped to 1 and 5 (for the Baron). No special benefits, loot, recipes or such are given for being Exalted with Ratchet, beyond the usual 20% price decrease when using their vendors, but it doesn't hurt to go here and grind a little on your way to level 20 for some extra reputation along the way. Used to be that if you were exalted with the city that you could attack the opposing faction without any repercussions. I don't have that character anymore so i don't know if it is still that way but that was the only purpose i saw in being exalted with any of the Steamwheedle factions, being on a pvp server. This faction got name by Ratchet and Clank game??? This must be bugged. Comment posted about 5 to 25 rep for killing pirates near ratchet. With a 70 warrior on Zangarmarsh PVE server I am getting no rep for ratchet, but strangely enough I am getting sometimes 1 rep every other kill or 5 rep for killing the baron but with the Everlook Faction... i know it's weird. I am trying to farm the deviate fish recipe here and figured I may as well get some rep while i farm... all steamwheedle cartel rep is going up... except for ratchet. Hope yours works. (edit) I am revered with all 4 goblin factions by the way. From what I am being told in comments below it makes a difference. If you are a pirate, turning 2 stacks of Linen Cloth and 4 empty vials will give you +500 rep with Ratchet, +250 rep with other three goblin factions and -500 rep with Bloodsail Buccaneers. 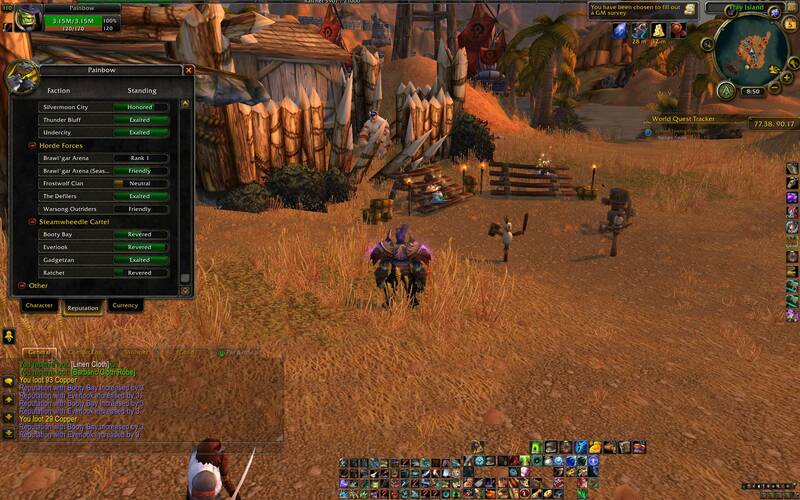 You can now get 3 rep for all Steamwheedle Cartel for killing all venture company mobs in Grizzly Hills of Northrend. Look around Venture Bay for mobs in the Southwest corner of the Grizzly Hills zone. Hope this info helps for those trying to get The Exalted title. Happy hunting. (edit) (01/20/09) I am revered with all 4 goblin factions by the way. From what I have read here it matters, hope this helps clarify any confusion for you. (edit)(01/28/10) the venture company evacuee mobs now give 5 rep, and the venture co stragglers no longer give rep at all. I am revered with all 4 goblin factions and am getting rep with steamwheedle cartel, hope this helps to clarify my above post for you. I've been farming (Honored with all Steamwheedle Cartel)these and geting 5 rep for Ratchet, and for 2.5 rep with all others. You dont ever get 3 spillover rep, its always half. It looks like it goes up by 2, then 3, then 2, then 3, so it techinically is going up by 2.5. Anyways, I just hit 11999/12000 Honored, and it stopped! I still get 2.5 for all the other factions, but as for Ratchet, I no longer rep up off these. This includes our dear friend Baron Longshore. one of the areas whare when you get off the flight plan the boat is just starting to leave. Rachet is a nuteral town because it is controlled by goblins, therfore alliance and horde can both quest here. Also a very nice quest hub for anyone who has little or no quests left in The Crossroads. Basically if you ruin your faction with these guys, you're done. Most of these posts are 2 years old or more. It will be near impossible to regain your faction for these guys. Don't get the title unless you do not care about the above factions, or you're done. Blizzard killed the DM rep grinding, you can no longer go in DM for the rep. Cloth turn in? The NPC outside of Gadgetzan won't speak to you if your Hated/Unfriendly. You're basically done with this faction for good if you screw it up. Also, you can not do quests in these areas to get your rep up because the faction will not allow you to speak with them. Good luck to a dead faction! There is a boat in Ratchet which goes to Booty Bay at Stranglethorn Vale (Eastern Kingdoms). Ratchet is neutral city in horde zone, which means that if you die your spirit will be sent in Camp Taurajo still in Barrens (far away south from Ratchet). I believe that the port of Ratchet is a Blizzard hommage to the PS2 game Ratchet and Clank. I got 305 rep after 5min of killing outside of Ratchet. Killed maybe 2-3 Barons among that. It will be a few days before I can tell you the rep at Friendly. Isn't it odd that it is also an Alliance flight path, yet it leads to a Horde area? I don't believe it has ever been the other way around. For people who are grinding this rep, keep in mind that there are two areas to find the pirates - one lower level near the water, and one upper level just northwest of it. You can make a circle between the two pretty easily and it's far faster than waiting for one to respawn. As of patch 4.0.3 with the new world change, Ratchet pirates that give rep are now at >Fray Island< (77,90) in northern Barrens. I have not found any other pirates giving rep yet like the tanaris or STV ones. 5 for ratches and 2.5 for the rest untill 11999/12000 then it stops giving ratchet rep just like before. There are also a handful of quests in Tanaris and Dustwallow marsh that are giving goblin faction rep now. I have gained about 5,000 rep doing these quest. There are a lot of quests here which are horde-only. Booty Bay has one which is Alliance-only, but it also has one which is Horde-only. Steamwheedle on the whole is a much easier grind for Horde. I found, that gaining reputation with ratchet is fastest by Bloodsail Swashbuckler, Bloodsail Warlock. It is small area, but VERY fast respawn. I also tried other (bigger) locations, but I always had to wait to respawn. Here you can grind without respawn breaks. Stragglers in Venture Bay do not give rep as of 4/19/11. Guys, I really am not good with maths but, I tried the tanaris grind, it just didn't do it for me. I went with the STV one just because of the named mobs giving 30rep( 30 for me since human+guild). I just cycled through the 3 boats in the southern most STV, the 1 camp on the beach to the north of the boats, and 1 camp right to the nort of BB entrance, 1 named mob also there.Also down in the boats, there are like 6-7 mobs in a 1 meter radius. It went better as much as I had noticed. In 4.2 things are a little different. I have to tip my hat to Gallogrupp for such an excellent post! I was Revered with all four factions when I started out in Lost Rigger Cove. Once I got to 20999/21000 Revered with Gadgetzan I stopped getting rep for that faction. I went to Fray Island and found about a dozen or so mobs that still gave rep for Gadzetzan and was able to pop Exalted with them! Yay! The spawn rate was nowhere as fast as it is in LRC. While I was waiting for them to spawn I thought I'd try the pirates on shore south of Ratchet but did not get any rep from them. Went back to Fray Island and they started respawning as I was there. Oh, there's one mob in the second floor of the hut there that gave 13/14 rep for different factions. I went back to Lost Rigger Cove but still no rep for Gadgetzan, but still got rep for the other three. I tried STV but there were a total of THREE Venture Goblins available for killing in the area by the lake thanks to the Snakes that are there now. I went down to Cape of Stranglethorn and was able to get some rep from the pirates on the three ships. The mobs on shore were not giving me any rep.
As of now I'm Exalted with Gadetzan and still Revered with the other three factions. I'll update this when I get more info. I'm curious to find out if LRC will only take me up to 20999/21000 with the other three factions as it did for Gadgetzan. When I get home from work and want to just chillax, I bring the laptop into whatever room I am in and log back into WoW. My main is parked in the right spot. I drop the guild banner and hit tab and then 4 four times. I go back to whatever it was I was doing. Every so often, I'd just hit tab-4 four times. This is fine when there's something good on TV or I'm on the phone. I'm still getting rep with all four factions for the minor NPCs. Garvey doesn't give rep into revered for Ratchet, but the spillover is good for the others and I don't really have to pay attention to the screen. It's slow, but requires almost zero attention. Pity I can't teach the cats to tab-4 for me. I can totally recommand the boat in Grizzly Hills. It's the middle boat at Venture Bay, between the Horde and Alliance boat. They spawn incredibly fast and you won't stand still for a moment. Also they got like 10k hitpoints, so they're one-shotted easely. Sometimes, when you're lucky, they spawn at the point of kill, my highest kill streak was 8 mobs. As a Goblin with max guild perks and guild banner, i received 7 rep with Booty Bay and 3 rep with the others. I continued untill i was Exalted with Booty Bay. Thus will the other 3 factions go till 11999/12000. You know the rest. To get the last point against exalted with Gadgetzan, kill one on the Fray Island, south east of Ratchet. I apologize in advanced if this has already been posted, but it is something I noticed while I was doing Desolace. At coords 60x28 there is a goblin related to the Rachet faction named Bizby Bizby. He DOES NOT give any reputation with the steamwheedle cartel factions so if you are just farming for rep, save yourself 10 minutes and skip this NPC. Pull 5-10 guildies or friends(maybe even pay someone) to go to the boat in Grizzly Hills - Venture Bay-- coorinates roughly 14x81. Assign each person to a spawn point, ideally a class with lots of fast/unlimited instant cast spells(Icelance for example). Make sure everyone is buffed as much as possible, the speed of this is from being able to one or two shot the mob. There are only about 15 spawn points all mashed within that same boat spread across 2 decks. The respawn is insane. As long as everyone is consistant about the speed of their kills, the respawn is INSTANT. Sometimes there are short breaks between each respawn, but it lasts a matter of seconds. This is not only fast, you wont go insane from bordem. You can actually challenge yourself to see how fast you can kill in less than 10 seconds or something, the respawn is that fast with an adequte size group. I did this with 5 people(inclding myself) while waiting 20 minutes for an LFR to come up. Long story short, just with the 5 of us, I had gained ~3000 rep in that 20 minutes. Rep for this faction is tranferable to all party AND RAID members, so the more you bring, the better. Lastly I would like to add that this is the one spot where if there is another group there, it is better because of faster respawns. For example, there were horde on the top deck, and I had the bottom all to myself. the respawn was fast enough that I was almost getting it as if I had 3-4 people with me and we had the boat to ourselves. Obviously this only works if each faction stays in their own area and doesnt try to steal the opposing faction's kills but if you compare this to any other location where the mobs are spread, this is FAR faster and more leniant. PATCH 4.3.3 I am revered with all 4 factions. Right now when I grind rep in Southbreak Shore (its right by Lost Rigger Cove) in Tanaris I get 5-6 rep for Gadgetzan and the spillover is 2-3 for Ratchet, Everlook, and Booty Bay. I find Southbreak Shore is a little better than Lost Rigger cove. While there are more mobs at LRC the respawn rate is a little faster in Southbreak. I just run from one to the next and never have to stop and wait on a mob to respawn. The rep is the same in both places. Since Ratchet is my lowest rep I decided to try Fray Island. But, At revered you get ZERO Ratchet rep on Fray Island. You do still get the 2-3 rep spillover for Booty Bay (2 rep), Everlook (2 rep), and Gadgetzan there (3 rep). Since I didn't grind there before I was revered I do not know if you still get Ratchet rep from neutral through honored or not. Went to Grizzly Hills at revered. Got Zero Booty Bay rep and 3 rep per piece on the others. I guess I'll stick with Lost Rigger Cover and Southbreak Shore as long as I can for now. Pirates at Southbreak Shore in Tanaris give Ratchet rep when at revered. Farming low-level mobs with Ghost Wolf + Lightning Shield (with its glyph) works great, just tag things and let the orbs take care of the rest. It's good to be shaman sometimes. BUT there's something I noticed... when I just let mobs hit me and get killed, rather than right-clicking to hit them, I didn't get rep for the kill. I guess it's some anti-botting measure, the game demands input from each kill, like you can't let your warlock demons do all the damage. For those that are prone to long Afk's a way I found of getting rep while afk is. Get damage done to attacker items and afk right on top of Capitán Garvey, at 85 you will not have any issue dying obviously. Shield users can get Punta de escudo de elementium. any one with Sulfuras, Mano de Ragnaros Can also do it. Guarda de liquen petrificado Sporeggar Rep Reward sold by Mycah Available at honored. Disco reactivo a la fuerza Engineers only shield the plans are a low drop rate from Molten core bosses. Costillas de truenos An item cooks can make but only lasts for 1/2 hour. If there is anything else available in game to add please list it for any one wanting to do this method. I am not saying this the quickest way, Or best way. But you can get rep while not at your computer with out using a botting program. Sounds like a good deal to me. To my understanding Insane in the membrane achievement is bugged from the comments on wowhead and my personal experience i just got honored with bloodsail buccaneers and as soon as handed 40 silk cloth and 4 dye to the traitor... my progress on the achievement i m not sure what its called but my progression went from green to grey if that makes any sense. But one of the comments stated that they contracted a gm when they had all the Streamwheedle Cartel fractions and Darkmoon Faire exalted they linked them the "Avast Ye Admiral" achievement proving that they were honored with the Bloodsail Buccurnneers but the achievement progression didn't count that or something rather. Right now i m working on my Streamwheedle Cartels ((Booty Bay)) once that I Have all of them exalted can i open a ticket and ask a gm to award me the achievement. Even thought in-game it says i didn't get Honored with Bloodsail Buccuneers. If not i will have to grind goblins again... and i m hatred with bloodsail again. I understand you'd like to know if we'll grant an achievement for "Insane in the Membrane" once you have Booty Bay exalted. I recommend first checking the armory. If you aren't familiar, the armory is a public view of a character that can be found on our website by searching your character name. Sometimes when the UI for achievement progress behaves oddly, the armory can present the proper progress. Now if the armory does not prove helpful, I can say that if you earn the Avast Ye, Admiral achievement as well as being exalted with Booty Bay, Gadgetzan, Darkmoon Faire, Ravenholdt, Ratchet, and Everlook, and we can verify all this, then we will go ahead and grant the achievement. The reason being, that we're unable to accurately verify honored for Bloodsail Buccaneers. If any other issues pop up, please feel free to contact us again. I hope I've addressed all of your issues today. Thanks very much for traversing Azeroth in style! So as of patch 7.2, Fray Island is not giving any reputation for Ratchet when you kill the Southsea pirates. I'm only getting spillover rep for Booty Bay and Everlook. Every guide I've read and watched said you want to get from Revered to Exalted with Ratchet on Fray Island and then finish off Steamweedle Cartel from spillover rep from Tanaris pirates. Here I am on 2017-04-05 killing pirates on Fray Island and getting no Ratchet rep. But if I have to get from revered to exalted with Ratchet using only spillover rep in Tanaris, this is going to be very painful. I think this is a new issue since I have not found anybody else mention it yet. Where do I farm the rep? For Booty Bay - in Booty Bay. For Ratchet - in The Barrens. For Gadgetzan - in Tanaris. (For Everlook - no where, jsut from spill over in other areas. They do give rep for the main faction (till Honored) plus a spill over for the other faction. So, after Honored you only get rep for Ratchet in Tanaris or SVT. As for as I reason that give that you always farm in the areas where your highets rep is (at least untill Honored with the three main factions). At Revered Tanaris gave me reputation for Gadget and spill over for the others (don't know about BB as I'm Excalted with them). At 95% to Excalted it stopped give me rep at the northen camp, I moved to the southern one. From what I can tell, you will get rep with your lowest factions and work up. Parte del Cártel Bonvapor, esta ciudad goblin constituye un santuario neutral para los que desean realizar intercambios comerciales y de servicios en los Baldíos.